Features 2 rulers. Retractable hanging hook. Low-profile clip with grip. Made with tough hardboard material to prevent bending and snapping from any accidental bumps and/or drops. One of the most versatile tools of any office, school or business. 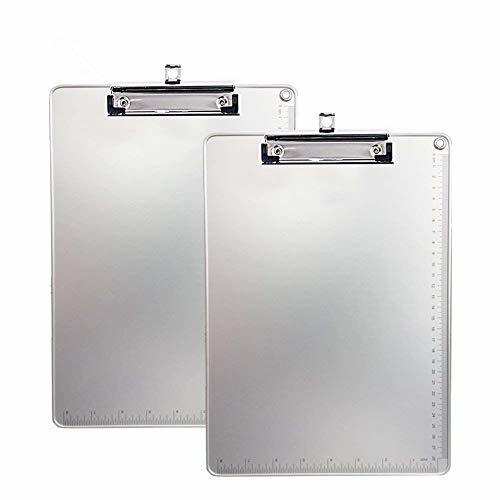 The clipboard has so many applications it has become a staple of office products and a symbol of productivity and organization. PROVIDES A SMOOTH SURFACE TO WRITE ON: Easy to Write on While Keeping Your Documents Safe. COMES WITH STRONG AND STURDY LOW PROFILE METAL CLIP: When Loading your Paper, The Clip Easily Tilts Back and Secures Them in Place. WITH SCALE DESIGN: Clipboard features a metal clip for securing papers and 2 rulers etched onto each side: both a Standard and a Metric Ruler! RETRACTABLE WALL HANGING PEG: Will Come in Handy When You Need to Mount it to The Wall. Retractable for Multipurpose Use. PERFECT FOR TRAVELING OR ON SITE NEEDS: On The Go Much, PaperyPro Clipboards Keep Documents Close at Hand. Some profession that would benefit is medical, contractor, coaches, nursing and great for kids.